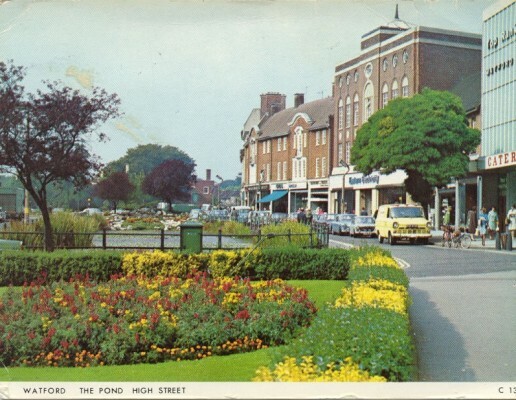 The Pond, 1960s. Top Rank to the right. I have best remembering of Watford. In the years 1963, 1964 and 1965 I have play football with my youth team VfB 08 Lünen. We was guest of the players from the North Watford Football Club. The manager was Charlie Pinnington. My English friends are in this time are Kevin Stratford, Mick Harman, Dave Charlwood, Paul Saviner, George Gaiscoigne, Long John and many other players. Wonderful friends. Now, 47 years later (I am now 63 years of age) I remember this very nice time. We was every day in the town. From the Town Hall to the Pond. Watching the wonderful Watford-girls… Have a coffee in the shop right from the Top Rank. .. And the Top Rank. We never saw a Dance pub like the Top Rank. Music we never heard in Germany. We have much fun there and have contact with many young Watford boys and girls. The wonderful shops in the town. Clements, Marks & Spencer, Woolworth – and the Market. A fooballer from the Watford team was there and sell fruits. Later on he was milkman. And the pub Green Man. We come with perhaps 8 boys in the pub for a drink. We have a nice morning. We was hungry and the Barkeeper give us sandwiches – free!! Watford High Street was for us young peoples like a film, watching watching watching. I remember the little clubhouse from the football club in Garston. 1963. I stay in a family home in Garston, The Brouw. A nice family, Jones, live in 105 Newhouse Crescent. Some nice hours we have there. After my football time I was some times in Watford. The last time was 2008. My good old friend Kevin Stratford died. But it is not the Watford I know from the sixtees.The big roads in the town center. All nice shops are gone. The Harlequin…. I live in The Harebreaks and in Bushy in the house of Mick Harmans parents. If somebody remember us and me from the VfB 08 Lünen please give me a message. This page was added on 07/12/2010. ..many years ago …. perhaps someone from the North Watford Youth Club remember our visit?? Hello from Germany, Does anyone remember the visit of a German soccer team from Luenen (VfB Lünen 08) 1963 and 1965? We have lived in English families. We would like to contact our English friends. Who knows the time nor the player from the North Watford Youth Football Club? Mick Harman from Bushey, David Charlwood, Saviner Paul, George Gascoigne from Maytree Crescent, Brian Vickers, Barry Cook, Long John and manager Charlie Pinnington. We had a wonderful time at Watford.